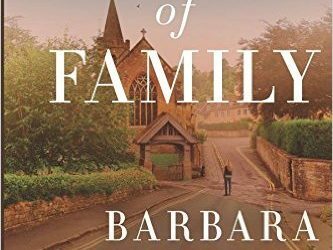 A Brit living in North Carolina, Barbara Claypole White writes hopeful family drama with a healthy dose of mental illness. 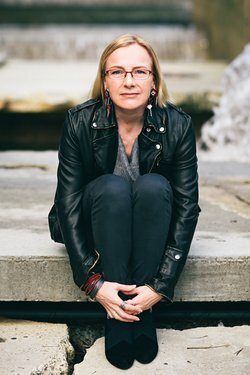 Her debut novel, The Unfinished Garden, won the 2013 Golden Quill Contest for Best First Book, and The In-Between Hour was chosen by the Southern Independent Booksellers Alliance as a Winter 2014 Okra Pick. Her third novel, The Perfect Son, was a semifinalist in the 2015 Goodreads Choice Awards for Best Fiction. 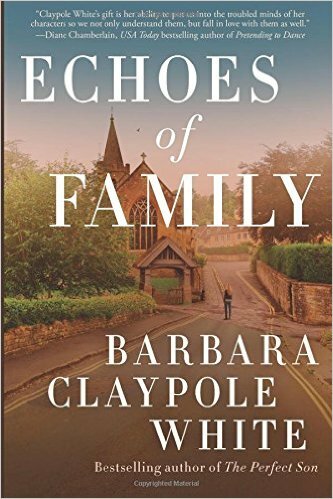 I’ve heard Barbara Claypole White’s name forever, it seems, and yet Echoes of Family is the first time I’ve actually read her writing. Even so, falling into this novel was like falling into the story of an old friend. Marianne, with the trauma that has lingered with her from girlhood, is sometimes manic, sometimes darkly depressed, but always a force to be reckoned with, and she loves with all her heart, when her head lets her. Jade, her unofficially adopted daughter is also a compelling character, and watching the way the stories of these two women unfold and overlap each other was incredibly rewarding and satisfying. Fundamentally, this novel is about family – the kind we’re born to and the kind we choose – but it’s also about grief, loss, personal growth, and letting go of the things we cannot change, or that merely fester in the deepest parts of psyches. Claypole’s characters are dimensional and real, but it’s her handling of the interpersonal relationships between them that I found completely gripping. The simplest interactions are laced with nuance and subtlety that just sings off the page. If you enjoy contemporary fiction with female characters who are both strong and realistically flawed, you will absolutely love Echoes of Family. Barbara Claypole White writes and gardens in the forests of North Carolina. 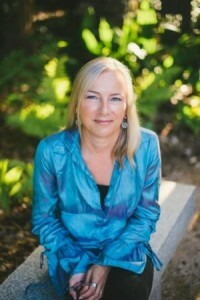 English born and educated, she’s married to an internationally-acclaimed academic. Their son, an award-winning poet / musician, attends college in the Midwest. His battles with obsessive-compulsive disorder (OCD) have inspired her to write love stories about damaged people. The Unfinished Garden, Barbara’s debut novel, won the 2013 Golden Quill for Best First Book. The In-Between Hour is her second novel. That paragraph, from near the end of The In-Between Hour (but no spoilers, I promise), is one of the perfect human moments that made me fall in love with Barbara Claypole White’s second novel. She has these moments all through the story, and every time, they make me nod or smile, not necessarily because they’re funny, but because they come from a place of truth. I confess I was a bit leery when I realized this was technically a Harlequin novel. Okay, it’s Harlequin/MIRA, but still…they do have a reputation for being more than a little bit, well, fluffy. But In-Between Hour, while a romance, is anything but fluffy. Instead, it’s a lovingly constructed glimpse at a man grieving for his lost child and coping with a father who is showing signs of either Alzheimer’s or dementia, and a woman who gives as much time and energy to saving animals as she does to caring for her (adult) children, one of whom is quite broken. It’s also the story of an aging father trying to save his memories of love and loss while still being a parent (because you never quite stop) and another woman, who is a friend to all but doesn’t always love herself as much as she should. It’s a story about real hearts, all of which are slightly cracked or dented, as happens in this journey we call life, and it’s a story about how if we’re supremely lucky we can find a person – or people – whose damage doesn’t clash too much with our own. Author White handles everything with finesse and an attention to detail that is both elegant and entrancing. Her dialogue feels real, and her characters feel like people you might encounter – funny, flawed and fabulously three-dimensional. I like that she sets up a possible “perfect ending,” but leaves things loose enough that free will still plays a part, and I like that all of her characters have their own intelligence, even though some of them aren’t necessarily well-educated. Most of all, though, I liked that even though this was a conventional romance in many ways, The In-Between Hour was unconventional enough to keep me interested from the first page to the last. Goes well with coffee with a touch of egg nog instead of cream, and chocolate gingerbread with candycane frosting. This review is part of a virtual book tour. Click HERE to visit the tour page and see the list of stops.